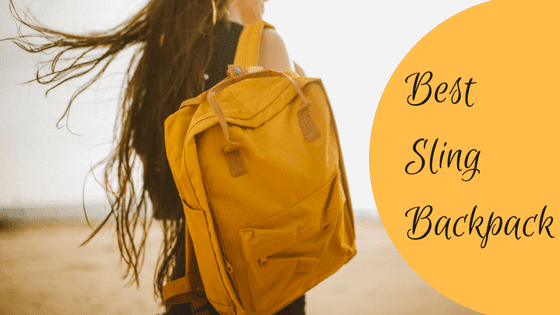 A backpack is your most special buddy while in travel. It helps you to keep your stuff secure and hold it in one place. Therefore it is necessary that you chose a friendly bag which meets your basic requirements. 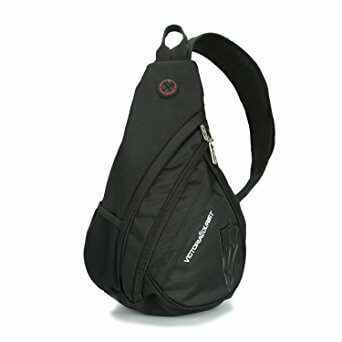 Sling bags are easy to carry and highly comfortable bags. They are one strap backpacks and are very useful for keeping important things like your phone, laptop, house keys or car keys, magazines, water bottle, some pens, and eatables. Sometimes they are also called messenger bags and this name roots back in ancient times. These bags can be worn as a backpack as well as chest bag. First of all, let us see what you need to keep in mind while searching for a perfect sling backpack. 1. Capacity: The most important factor while choosing a sling bag is the capacity you want. For instance, if you want to keep your laptop and few other items in the bag then you must go for a large size bag. 2. Water Resistant: Since you are using the bag for travel, it must be water or tear resistant. It is an additional requirement to keep your important stuff like phone or tablet safe. All the below-mentioned bags comply with this feature. 3. Pockets: Another additional advantage your sling backpack must provide is pockets. The pockets help you in keeping the stuff in an organized manner. This also indirectly makes more space in the main chamber of the bag. All the bags below have separate pockets for different things, especially for a water bottle. 4. Price: Keeping in mind the fact that you must not compromise with the quality and at the same time the price should not be too much over budget, all under-mentioned bags are less than $50. I have seen innumerable bags before finalizing this list and analyzed that the competition has risen in the travel industry to such extent that today you can easily get good quality travel material in a quite affordable cost. This bag is known for its space and pockets. Despite its size, it can commemorate a 13.3 inch MacBook Air and still have room left for other things. It has well-organized pockets and a stunning Vintage look, which makes it a perfect gift item. It has PU Leather decoration on the pockets. 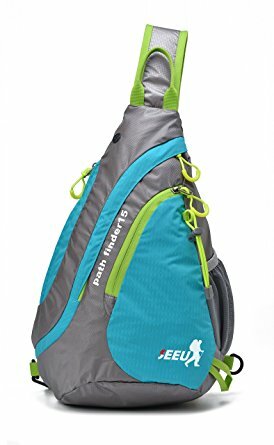 Although it's a great tactical daypack for school, camping, cycling, traveling, what it lacks is comfortable padding on the back. There is padding on the strap though. Overall it satisfies your basic needs and also provides you with an added advantage of good looks. This bag is said to be ultra-light weight and is medium size. It has a 3D breathable back made of nylon mesh which reduces frictional heat at the back. Along with being water-resistant, it is also scratch resistant. It is best suitable for hiking, trekking, camping, shopping and a lot more. 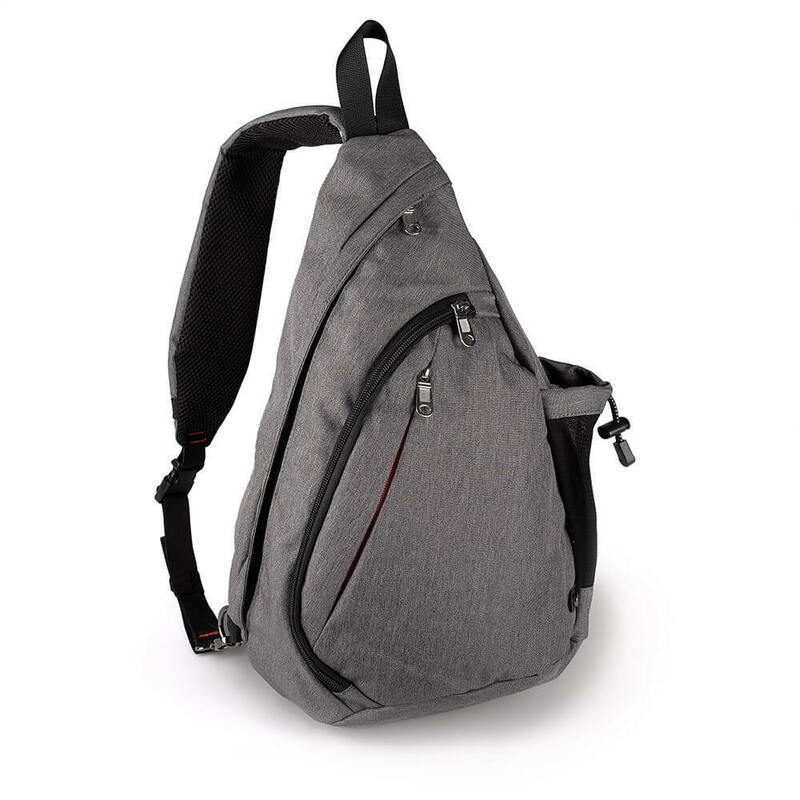 It has in all 5 pockets and a special headphone hole to enjoy music when the large device is in the backpack. If you are looking for light weight and foldable bag then this is perfect for you. It comes in five different color combinations. This bag is specifically designed to fit in a 14.1-inch laptop. It has a separate water proof padded compartment for keeping the laptop. It can easily fit a MacBook Pro and Air, Ultrabooks, school books up to 15.6 inches. It has total 10 pockets, 4 small pouches and 3 pen holders in the main pocket, 3 outside pockets with 1 side pocket for keeping a bottle. It also has a headphone holder at the top. It suitable for those who have the need to carry laptops with them everywhere. Available in black, blue, dark green and grey colors. If you want a bag with looks and comfort at the same time then this is best for you. It is a light-weight but spacious bag with 3 main zipper compartments. It has a padded strap and a headphone cable hole. Whats new is mesh padding in the side pocket. Overall it is very cost efficient and can be used anywhere. You get several other pockets inside the zipper compartments. Because of its medium size, it can fit up to a 13-inch laptop or tablet. It is available in black, upgraded black, gray, dark blue, green and gray, fushia red. 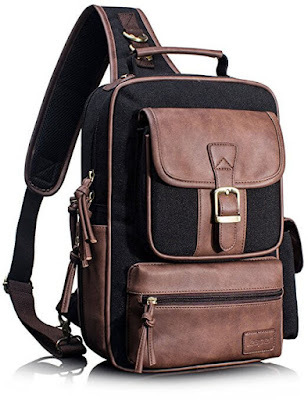 It is top selling, most versatile and spacious sling backpack. 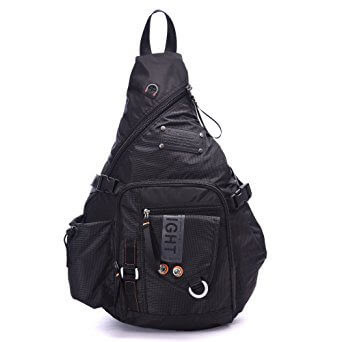 It can fit up to a 12inch iPad or laptop in its main pocket and it also has many other organized pockets to keep your phone, spectacles, camera, deodorant bottle, an Anti-Theft pocket to keep your keys and a strap pocket to keep a mini notebook, cell phone, and candies. It comes with a large softly padded shoulder strap which is reversible i.e. it is suitable for both lefties and righties. It has breathable ribbon on its back which reduces sweating and increases comfort. It comes in Black, Grey, Dark Blue and Green colors. 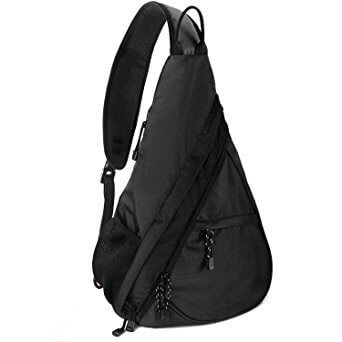 It is a cute drop shaped small black sling backpack which is best for holding all your limited essentials like batteries, camera, mobile phone, charger, wallet. It definitely has a number of separate pockets and side mesh bottle pocket. It also has a zipper pocket on its strap for keeping keys and other things. It is a good choice for one-day trip or weekend trips. It can be used casually on shopping as well. It is available in only Black color. It is an easily foldable bag with 3D breathable mesh strap, however, the back is not padded. It is quite spacious and can easily hold an iPad Air. 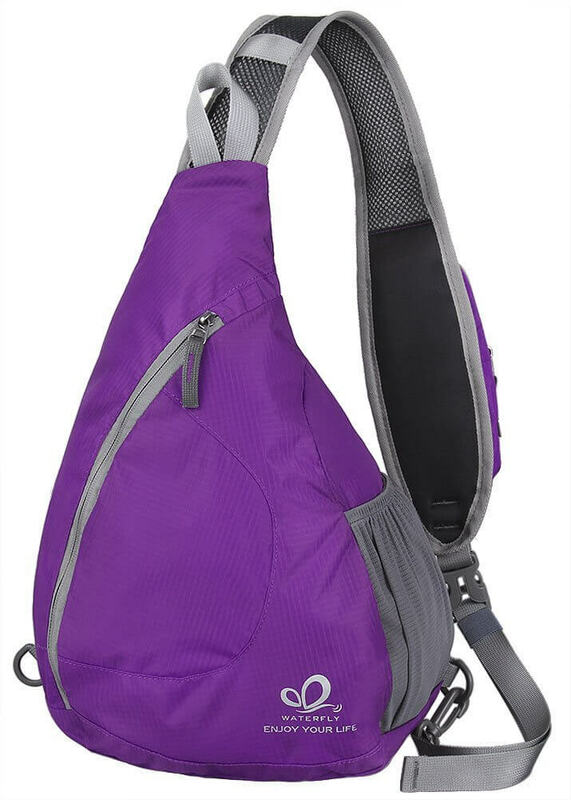 It has one main pouch and 4 small pockets outside. It does not have side mesh. Overall it can fit all your stuff and is best for trekking and hiking. It comes in black, olive, blue, pink and purple colors. 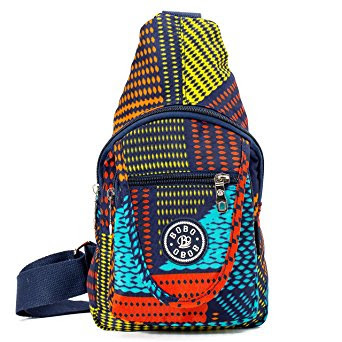 Bobo mini sling bags come in six prints and colors, therefore if you are looking for a colorful sling bag then you must check these out. Apart from being colorful, they can hold all necessary items very easily. The only drawback is that it does not have padded strap or back. It comes with a braided shoulder strap which can bear a lot of weight but is not that comfortable as the mesh one. It has many pockets to organize the stuff but no side pocket for keeping water bottle. After reviewing all these sling bags for travel I can say that there is a very slight difference in the utility of every bag. Therefore you must read thoroughly about each of them and then select the one which best suits your requirements.